New Zealand filmmaker Taika Waititi goes to the bush for his latest film, Hunt for the Wilderpeople, loosely based on the adventure book Wild Pork and Watercress by Barry Crump. A hilariously goofy and warm film about outcasts surviving in the wild, it's an undeniably charming film with a wide range of emotions and sophisticated humour. 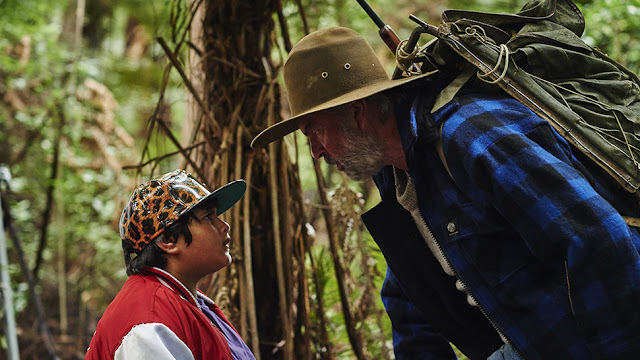 Starring Julian Dennison as Ricky Baker, a preteen juvenile delinquent orphan, and Sam Neill as Uncle Hec, his reluctant survivalist foster parent, Wilderpeople uses the pair's offbeat but winning chemistry splendidly without ever exploiting too much of the absurdity and emotions of their situations. Set against the gorgeous backdrop of the New Zealand outdoors, the film uses scenery and the wild to enrich the internal sadness of its characters. Dennison truly gives a delightfully touching yet hilarious performance just as Neill is restrained and gruff but clearly still loving. Much more ambitious and visually rich than his previous films, mostly small indie comedies, Waititi shows his maturation and sophistication as a filmmaker. The action, random but pleasant soundtrack, and manhunt narrative should make the film a bizarre, ridiculous absurd take on family and outdoor life, but instead, it makes for a heartwarming, coming-of-age family comedy of errors and mismatched lost souls. Essentially a buddy film, the supporting cast shows up in bits to build up the pair's chemistry from comedian and Flight of the Conchords collaborator Rhys Darby as a crazed wild man, Rima Te Wiata as Aunty, and Rachel House as the evil social worker. The beginning is nothing short of a completely heartwarming and redeeming case for foster care without much sentimentally succeeding solely on its lovely performances before the conflict and action really start. I could have easily watched an entire sitcom style story based on Ricky joining his new foster family without ever escaping into the wild. Hunt for the Wilderpeople is an absolutely winning film about survival, not so much in the wild, but alone and together as individuals. Waititi populates the film with individualistic themes while making the case for alternative family dynamics and showing his penchant for broadly appealing comedy. Neill and Dennison make for a strange, but ultimately, dynamic pairing as reluctant surrogate father and son living in the wild and surviving each other.